We see large numbers of 15-18 year-olds volunteering abroad on our projects, especially during the months of July and August. Students take advantage of their summer holidays to volunteer overseas on one of our projects for two or four weeks, or even longer, if their timetable allows. If you have just finished your final year exams and are not planning to take a gap year, you may be able to fit in as many as twelve weeks of volunteering. It is fantastic to see people volunteering at such a young age, and it seems to foster such a sense of responsibility and maturity. It is not just us that think so. 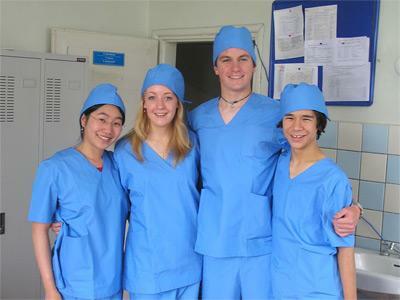 Volunteering overseas is seen, by both universities and employers alike, as a positive use of time; something which sets individuals apart from others when applying for university courses or jobs. If you can't decide which voluntary project is for you then you can always call one of our Programme Advisors who will talk through your options with you. If you wish we can even put you in touch with one of our ex-volunteers. For a list of schools and colleges from which we've had volunteers in the past click here. If you want to spend some time volunteering on an overseas project, but cannot find time to go for a whole month, you may be interested in our High School Specials. These are projects run on specific dates, to guarantee that there will be other people of the same age volunteering with you. We provide additional supervision and activities - evening meals, shows and weekend trips - for the duration of the project, as well as all the normal services. These are a fantastic way to gain work-experience and enhance your CV or UCAS form. "At 17 and just out of school, about to apply to study medicine, and with no plans to take a gap year, although keen to see the world, I came, by chance, across Projects Abroad. I spent a month volunteering in a Ghanaian hospital. The entire experience was amazing, from my welcoming host-family to the friends I made amongst the other volunteers, but, above all, the placement. At the hospital the staff were extremely friendly, and gave me responsibilities I would never have imagined possible. I was taught to carry out patient consultations and basic medical inspections, assess post-natal and post-surgery patients, and even observe surgeries. Witnessing medical practice in a developing country was a fantastic experience; being actively involved made it unforgettable"